Each year and time to time, the Election Commission announces voter enrolments are being made and interested persons may apply for it either online or off-line. But it is not so easy as the CEO may be thinking of it. Whether it is a fault of the Election Commission staff or the media; the message mostly does not reach to the needy public in time. I do not know what are the algorithms of the Election Department that they consider or adopt in reaching to the public. They might be getting assured that they have done their job by making some public announcement on loud speaker in the colonies or by giving an advertisement in some newspaper. But are they sure that the newspaper in which they have given ad reaches all the intended public definitely and they will receive 100% response? People buy their own choice of newspapers and the election commission does not take pains to insert the advertisement in all newspapers of that region. So, the information will not reach even 25% of the would be enrollers. Coming to public announcements on loudspeakers in running vehicles hired for the purpose, there are many glitches. The first thing is, the voice is not clear. Most of the words are not clear to the listeners who may try to hear from their apartments. The second point is, the announcing vehicles do not take the pains to stop a while at frequent distances and then run the tape announcing the message. They keep on moving hastily and the tape is uttering sounds not clear to the listeners. I think the best way to reach public is by stopping at every 100 meters or 200 meters of distance and at all junctions of roads while announcing public notices like these so that public can clearly understand what is being announced. This should be done well in advance of starting the camp or enrolment drive so that people have ample time to get any documents ready and respond timely. Another way to reach public best suited is, to distribute pamphlets. This will ensure that everybody is reached to convey the notice or message. It should not be done through newspaper boys. Some staff should be delegated for proper distribution to all corners. Having enough said about public announcements and distribution of pamphlets, now I come to the point of staff of the election commission or the agents and volunteers entrusted with the job of enrolments and collection of application forms from intended voters. On my personal experience, I have undergone much trouble in applying for my enrolment to voters list for two years and even now, I am unable to get myself enrolled in the proper sense. Two years back, I was residing at some other locality and after six months efforts of approaching various poll booths and municipalities, I got my name appear in the Puppalguda voter list near Manikonda. But unfortunately, I had to shift from there due to some family problem which was unavoidable. At that time, only my name was included in the List of Voters and I was not provided with Voter ID card. I was informed that it will take more time to get the cards. So, I went to Manikonda after one month or so, from Secunderabad, to get the card and even then it was not available. We have shifted to a place from where I can not travel all the 30 km in buses and autos to take the voter card if it is available. So I left it and thought of applying for a change of voter residence and for the fresh amended card. From the new place, I applied again in Form 8 online for the change of address and I was required to submit the hard copy of the application also to somebody. 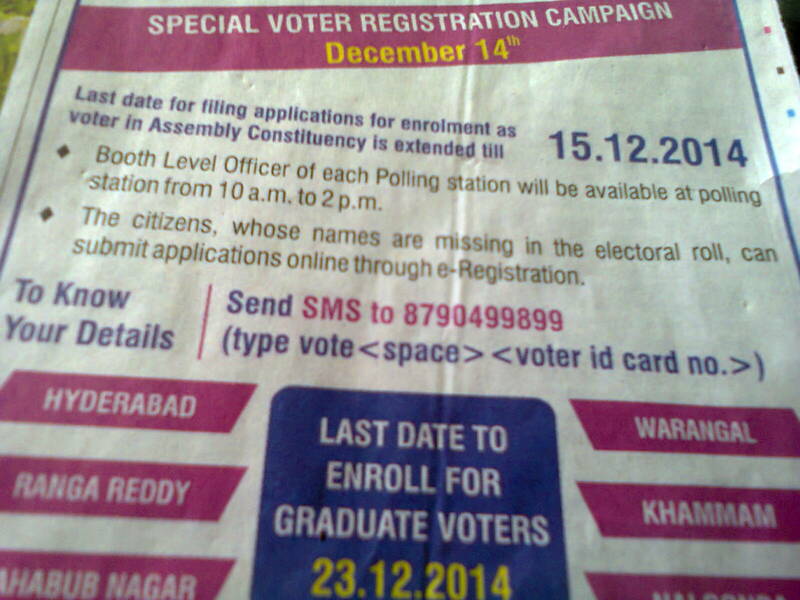 So, running from booth to booth nearest to my locality since many days prior to the elections held in Telangana, and till now, I am unable to submit it as nobody took my application form saying they do not deal with it or that they don't have any information of it. I have shown the notice of above imprint and also a copy downloaded from the CEO net that showed names and addresses of Booth Level Officers in my constituency to the places I went for depositing my hard copy. They informed me, even on yesterday, that they had no intimation for collecting the papers. So, I returned back. I was able to submit my application for Graduates Constituency at the Mandal Tehsildar office. They informed me that perhaps municipal office may collect my other applications. Why I am blogging all this is to inform about the agonies of the voters and the public to have their right to vote or for any other thing and how they are being treated. Everyone can not run from booth to booth or Municipal Office to Mandal Office for all these things. Even I am tired of all this now, as I am above 60 years old. I hope the concerned administration may view or come to know of the agonies of the public like me and may make some improvements in their working styles and administration. Polling booths may be located at every half-kilometer radius of localities so that any person may need to walk only half km. to reach his polling booth, not more than that. Aged persons and unable persons may be provided transport facility for voting. A separate queue may be provided for old people and disabled persons so that they can easily cast their votes without having to stand for much time in queues. Voter enrolment announcements, if any, should be made in advance with ample time through public announcements with the help of loudspeakers at each 100-meter distance of localities and through clearly audible voices and through the distribution of pamphlets to each residence in advance. Booth Level Officers should be made accountable for any lapses in their duty. If anybody accepts responsibility, he should deliver it perfectly; otherwise, he should not take responsibility.